Twenty percent of the world's fresh surface water is contained in the Great Lakes, which define our bioregion in Chicago. We are part of a natural system that provides water, sustenance and life to millions and millions of people in the US and Canada. City living can easily erase this awareness and consciousness of the natural environment. The city blinds us to the natural environment. 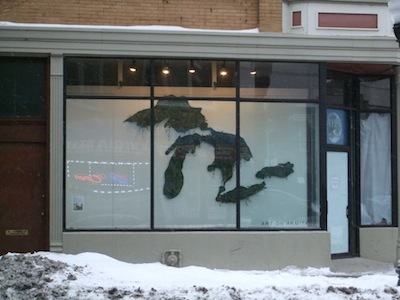 The Living Great Lakes Map is meant to bring back an appreciation of nature for all of us. Simply viewing this space constructed out of natural symbols and living things can recharge and refresh you, and cure your nature deficit disorder or warm you up in Chicago's winter. Falon is a landscape architect. In this installation, she has planted vinca in the felt lake cut-outs.